Radiant floor heating has vastly gained popularity over recent years, and has quickly become one of the most sought after heating solutions. Invisible Heating - With no radiators, boilers, or ductwork factoring in, you will have a quiet, peaceful, attractive home heating solution that leaves more room in your home for other things. Cleaner Air - Duct systems can be a huge problem for those with environmental allergies, as dust and mold are often blown into the room. With radiant floor heating this is not an issue! Energy efficient - Radiant floor systems are highly efficient when it comes to home heating and will save you money each month on your electric bill. With a new radiant floor heating system, hot-water tubes or electric wires are run underneath the flooring of your home. Waves of thermal radiation provide heat and warmth. Because heat rises, and the warmth is evenly distributed, it is an incredibly effective and efficient solution for heating any space. Hot-water, or "hydronic" systems, are available as well as electric radiant systems. Hot water systems are considered the most cost-effective radiant solution for an entire house, while electric radiant systems are often employed for single-room applications. Interested in radiant heat flooring? 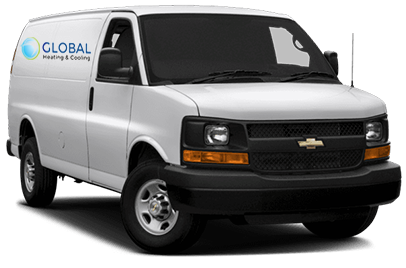 Call Global Heating & Cooling at (773) 801-3734 and one of our industry professionals will happily answer any questions that you might have. We will take several factors into account such as the size and layout of your home, desired floor covering (wood, tile, etc..), and budget to come up with a radiant floor heating solution that is right for you. Already have a radiant floor heating system that needs repairs? Global Heating & Cooling services radiant heat flooring as well as offering new installations. Right now, Global Heating & Cooling is waving our standard trip charge for repairs and is offering a FREE ESTIMATE on new installations.